Skerries Harps under 14s put up three gutsy displays at the Feile blitz last week in Malahide. The team was unlucky not to come away with more success on the scoreboard but in every other way the much anticipated tournament certainly did not disappoint. The girls played some wonderful football, gained invaluable experience and still had lots of fun. Having taken charge of all three Skerries games at the Malahide based tournament, referee Derek Greene summed it up perfectly when he spoke to the team after they had just been beaten in their final game by the eventual Feile champions, St Judes. “You are a very honest hard working team with loads of potential. Keep at it and the results will soon start to go your way,” he told the Skerries girls. The team has come a long way since last autumn. The pressure of starting secondary school had seen the panel shrink and just fielding for matches had become a challenge. But 2013 breathed new life with new players and the return of old players bringing a whole new impetus. Feile provided an opportunity to build on progress already made. Special mention must go to the under 12 girls (and their parents!) who had travelled with us on the day. Each one of them played absolutely brilliantly and they are extremely good footballers, a credit to themselves and to their mentors. Hopefully, just as some of the under 14s have found when they have helped out older teams, the experience of “playing up” will only add to their undoubted ability as players. Indeed, it was obvious that the most successful teams at the once a year festival of football often were those with very large panels bolstered by the best players from their younger teams. 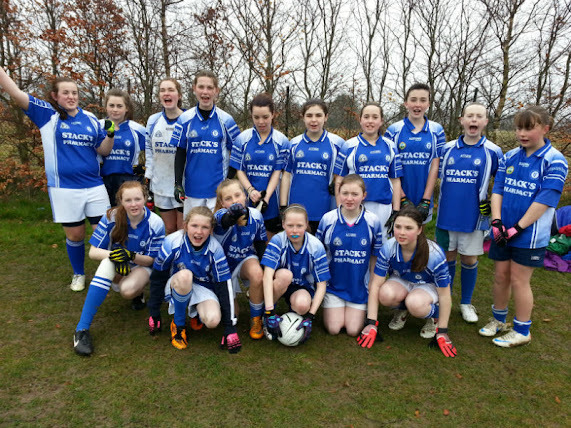 Feile certainly got off to a bang with a cracking game between the Harps girls and Raheny. For the first ten minutes matters on the field looked as ominous as the gathering grey clouds in the Malahide sky. In the first ten minutes Raheny threatened to overrun Skerries and notched up a few well deserved scores. But suddenly Skerries took the game by the scruff of the neck. They started to win all the possession at centre field and began playing some lovely passing football. That trend continued into the second half and the goals started to come - five of them in all. But an excellent Raheny team were giving as good as they got. While Skerries had much of the possession, the Raheny girls gave an exhibition in long range point scoring. It made for a most entertaining game of football and it was no surprise to us that Raheny later went on to contest the final. The game was in the melting pot until the final whistle. Sadly a late score clinched it for Raheny but the match gave everyone in the Skerries camp huge heart for the day ahead. It was with some trepidation that the Skerries mentors faced into game number two. About a month previously Robert Emmets had given us a bad beating on a day when we were beset with bad luck and injuries. The south side team were likely expecting an easy time of it. They were wrong. And the Skerries mentors need not have feared. The Harps girls more than rose to the occasion and, if anything, played even better in the second game. But there was one problem - we could not convert our chances and Robert Emmets could...with great efficiency. By the time the third game came around against St Judes the girls were tired, the wind had picked up and the rain had started. After two tough matches earlier on there were plenty of aches, pains and knocks to go around. But once the warm up started the girls put that all behind them. They knew they had come very close to winning already twice that day and anybody who had seen either match would not have begrudged them a final match victory. Right throughout the first half such a victory looked very possible. The Skerries girls fought, harried and chased everything. For long periods of the first half, aided by a blustery wind, Skerries pinned St Judes into their own half. Again they played some great exciting football. But again our shooting let us down (Pat Boylan would have been proud of our ability to hit the woodwork) and we failed to build on our possession. That meant the second half, against a strengthening wind, was always going to be tough. True enough, St Judes, who were a physically much bigger team, turned the screw. The Skerries girls tired visibly and the scores started to come at the wrong end. To their credit, the Harps never gave up and were in the game with a shout until the end. But in truth, they had come up against a really good team with a large, well organised squad (they had even pitched their very own pitchside marquee to shelter in between matches). It was not a surprise that St Judes went on to win the trophy in the end. The fact that St Judes ended up playing Raheny in the final - who Skerries had so nearly beaten earlier - was proof, if it were needed, that Skerries had definitely begun the day on the tough side of the draw. All in all, the players and mentors learned a huge amount from a brilliant day. Not least, the team learned that it really is a match for anyone. But most importantly the whole gang had great fun and we are only sorry that we can't do it all again next year.